Zero Mass Water and its Source hydropanels that literally create perfectly balanced drinking water from the air have been on our radar for a long time, so we were excited for the opportunity to connect with its CEO, Cody Friesen, at CES 2019 in Las Vegas, Nevada to talk about their panels. 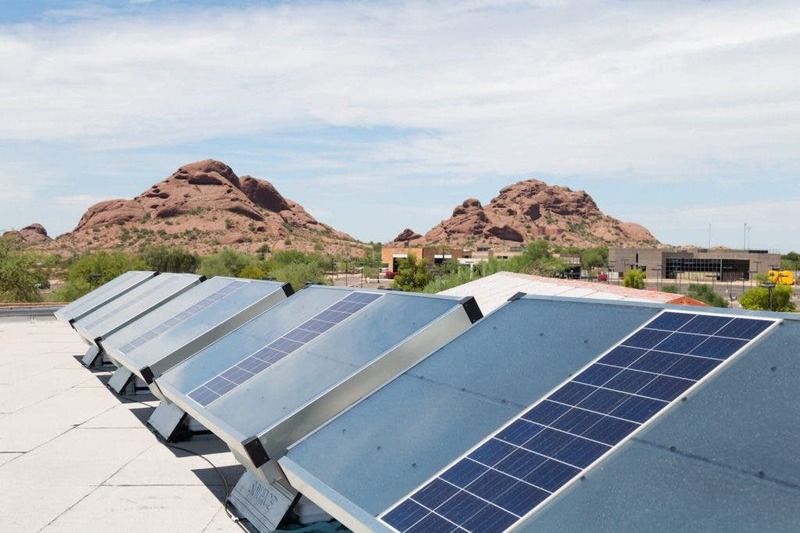 As a professor at Arizona State University (ASU), Friesen branched out and started a renewable energy company, but even after ramping that side project up to a global scale, Cody wanted more. More impact, more scale, more positive change for the world from his efforts. Being from Arizona, where water is treated as a precious resource, water had always been sloshing around in his brain as a curiosity and after putting some thought into it, he felt that his background in material science could be applied to solve the problem. “My background is not in water,” Cody said. “My background is in renewable energy and material science.” Just the same, he was compelled to pursue the matter and he spun up a pilot project through the university. After developing a few iterations of a minimum viable product, he felt it was ready to scale and the project was spun up and out of ASU, and in November of 2014, Zero Mass Water was born. Zero Mass Water’s Source hydropanels shouldn’t be lumped in with the rest of the atmospheric water generator’s on the market as those require external electrical inputs and thus, external infrastructure. “Actually, what we need to be talking about is a fundamentally different way of approaching water,” Cody said. 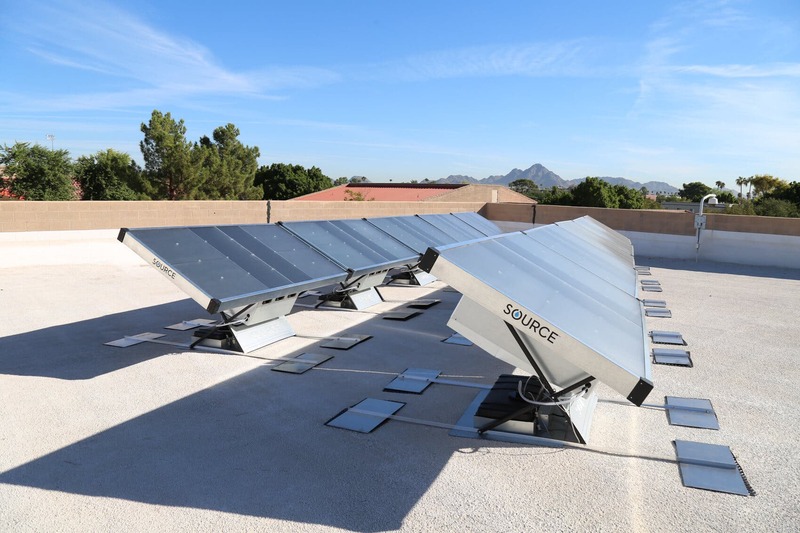 A Source hydropanel is, “a thing that looks like a solar panel, but instead of electricity, it makes fine drinking water with sunlight and air only,” according to Cody. You just slap them on the roof, face them towards the sun and they start producing perfect, drinkable water. Typical installations will see the onboard 30-liter water reservoir plumbed into the home to a drinking tap or even directly to a refrigerator. As water is created, an onboard, internet-connected sensor ensures that the water is perfect. That ensures that not only is there water ready to be consumed, but that it is safe to drink. 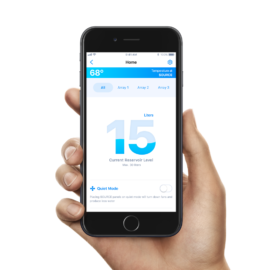 All stats and details about the water are sent back to the Zero Mass Water Network Operating Center which provides owners with the ability to monitor their system from a smartphone app. Having realtime data about all of their systems also lets Zero Mass Water continuously improve their systems based on learnings from all of the systems they have deployed around the world. The ability to create drinking water from just the air and the sun is great, but why does it matter and does it actually solve a problem? The short answer is yes. For starters, waterborne diseases are estimated by the World Health Organization to be responsible for about 1.8 million deaths per year, 88% (or 1.6 million deaths) of which is attributable to the lack of safe drinking water, sanitation and hygiene. Solving that alone would be impressive enough, and the fact that Source hydropanels not only produce water, but that they produce verifiably clean, drinkable water is huge. That’s great, but it really doesn’t mean anything if they can’t scale or aren’t economically viable for those who need them most. Cody was quick to jump on my skepticism that a $2,000 hydropanel could possibly be economically viable and started down the line to fill me in with the cost of ownership details. For the product itself, the water it produces over its estimated 15-year lifespan nets out to 15 cents per liter. For a resource that has the potential to save hours of walking everyday for people around the world, while also protecting them from the possibility of waterborne illness, that’s attractive. Add on top of that the fact that millions around the world are forced to pay for bottled water, with Mexico topping the list of the highest bottled water consumption per capita, with each person drinking 67.2 gallons of bottled water per year. This has created a $215 billion global bottled water market that simultaneously slurps water from precious domestic resources while extracting precious funds from consumers everyday. Source hydropanels give consumers the ability to ditch not only the disposable plastic bottles, but also to save money by producing clean, drinkable water at home, making the value proposition of 15 cents per liter much more attractive. It’s that much higher in regions where safe water isn’t even available, or where it is a constrained resource, like in much of the Middle East, northern Africa, and the southwestern United States. Source hydropanels are also rather low maintenance, with just a few simple items that need to be kept up on over its 15-year life. Air filters and the polishing block must be changed annually, while the mineral cartridge needs to be replaced every 5 years. That’s it. Even after its 15-year life, the unit will continue to function, but Zero Mass Water expects that the unit will need a detailed service at that point, after which it will continue to function. Changing the world wasn’t something that came to Cody naturally. In fact, even ending up as a professor at Arizona State University wasn’t really a part of his plan, but when the dust settled, Cody the reluctant academic found himself a professor at ASU. His PhD in Materials Science from MIT gave him the tools he needed to work on some serious problems and in 2007, he founded Fluidic Energy, which pioneered a new zinc-air battery that now boasts storage prices of under $100/kWh. His desire to simply listen to the data led him to build a company that sought not to prove or disprove ideas based on hypothesis, but to instead focus on the problem and to approach it without bias. That’s where the idea for Zero Mass came from, which speaks to the company’s desire to start without inertia in any direction as the foundational proposal for finding solutions to some of the truly wicked problems out there. It’s very similar to the first principles approach popularized in recent years by SpaceX / Tesla’s innovator/engineer/founder/polymath Elon Musk. Simply listen to the data and follow the resulting rabbit trail and beautiful things happen. Brushing off the Disney-flavored pixie dust on problem solving and it’s clear that innovation at Zero Mass Water stems from the application of grit and perseverance more than it does from fanciful maps and magic wands, but you get the picture. Cody Friesen and his carefully assembled team of missional maniacs at Zero Mass Water are dead set on changing the world, one drop of dutifully extracted and perfected water at a time. To get a taste for Cody’s passion for clean water and to learn about why Zero Mass Water exists, invest 15 minutes in the keynote below or head to the Zero Mass Water website.